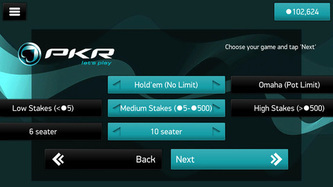 PKR offer stunning visual and a feature rich poker app for both iOS and Android devices. 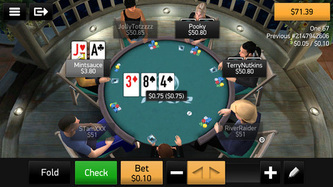 Their mobile client give players the change to take part in Omaha or Texas Hold'em ring games and Sit & Go tournaments in lifelike 3 dimensional gaming environments. PKR is no longer is operation. The best real-money poker app for players in the United States or anywhere on the planet is BetOnline Mobile Poker. Play poker instantly on any iOS, Android or Windows Phone. PKR works on Android, iPhone and iPad phones/tablets. Play mobile poker in over 20 3D gaming environments. Get £5 instant new player bonus when you download. Table limit Omaha and Omaha Hi/Lo games available. Few iPhone poker sites offer significantly more than the good old Texas Hold’em cash games, and PKR holds a special place among those that actually dare to go beyond the standards established by traditional 2D apps. The idea of mobile poker, PKR style is simple – get rid of the static two-dimensional backgrounds, replace them with wonderfully animated 3D environment and interactive player avatars and top it off with a rich game selection. As you’d expect, the end result is rather stunning, making PKR the most immersive and entertaining iPhone poker apps available on the market these days. Another cool things about the PKR iPhone app is the fact that you don’t have to register an account in order to give the games a closer look, as clicking the Browse as Guest button in the lobby allows you to take a tour of the software. The available play modes include Play Chips and Real Money and are toggled by using a large button located at the top of the screen – fortunately, making the wrong pick by mistake is impossible as each mode comes with a different set of lobby colors. Aside from playing, the lobby allows you to adjust your sound preferences, modify your account or choose between a two- and four-color card deck. Even though the graphics in PKR are more detailed than in other poker apps, I’d still strongly advise going with a four-color deck since you’ll be working with a rather limited iPhone screen real estate. 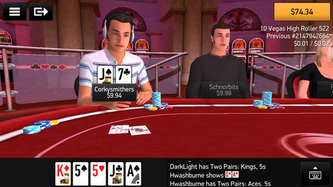 It’s also worth pointing out that the app comes with a neat and rather expensive explanation of the rules of every available poker game – and while this explanation definitely won’t replace reading a solid book on theory of poker, it’s enough to allow a new player to dive straight into the games without feeling confused. As mentioned above, the number of available games is rather unexpected for a mobile poker app. No Limit Texas Hold’em, Pot Limit Omaha and Omaha Hi/Lo fans are definitely going to have a field day with PKR since both cash game and Sit & Go variants are available with a wide range of stake settings that should satisfy recreational players and high-rollers alike. Even better, most games allow for heads-up and short-handed play aside from the popular full ring format, making for a solid, well-developed package that would be quite interesting even without the stunning 3D presentation. What really sets PKR apart from traditional iPhone poker apps are the graphics, which are simply stunning in table mode. Each player has a fully customizable 3D avatar, which is clearly visible in-game, complete with a set of great looking, realistic animations. The game is reasonably fast paced despite all the eye candy and the visuals make it easy to understand the situation at the table at a glance. As a result, the PKR iPhone app offers unrivaled level of immersion, but this comes at a significant cost as the general character of the app doesn’t really allow for an easy implementation of multi-tabling. Consequently, grinders are likely to be disappointed, as such functionality isn’t too likely to be implemented in the future. The competition is yet another reason to give PKR a try, as very few rooms can offer such a fishy hunting ground. Even if you aren’t all that experienced, it’s easy to become a winning player on this site – and if you’re willing to constantly improve your skills, your profits are likely to grow, especially once you start advancing on the stake ladder. Like on most other sites with such a soft player pool, the traffic on PKR can get pretty low outside the rush hours, especially when it comes to high stakes and less popular game variants. Nevertheless, if you’re happy with sticking to Texas Hold’em, finding a full table shouldn’t be a problem even late in the night. Quite obviously, the PKR iPhone poker app requires you to commit to a download and install a rather large, 400 Mb software package – running a browser-based 3D poker app would not really be feasible after all. As a result, it is recommended to download the app with a stable, broadband internet connection – I’ve tried downloading this app from the iPhone store using a mobile connection and needless to say it wasn’t pretty and basically took ages. The hardware requirements are also rather steep – while the app is guaranteed to run on any iPhone 4 and iPhone 3 GS, it has been optimized to work best with iPhone 5 and requires iOS 5 or better. Fortunately, if your iPhone can handle the PKR client, the entire setup process is rather simple and doesn’t take too long to complete. Once you install the software, you might want to check out the welcome bonuses PKR offers – especially since the choice rather impressive and each offer is generous in its own way. The Starter bonus doesn’t require you to make a deposit and gives you $5 free, allowing you to check out how thrilling real money poker can get without making an investment. The Intermediate bonus requires you to make a deposit and offers up to $125, which matches your payment 1:1. Finally, the Advanced bonus can give you up $500 and is a 150% match on your deposit, but requires you to make a payment of at least $150. Other than that, new customers can expect exclusive freerolls, tournament tickets and a cool refer a friend program which is actually beneficial to both you and the person you convince to join the site. 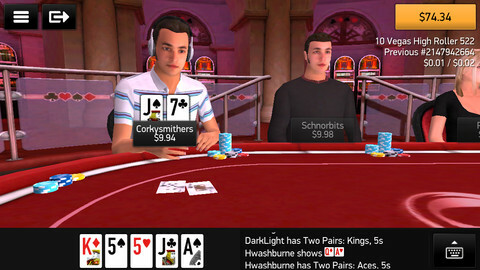 To conclude, I’m happy to report that the PKR iPhone poker app is far from being a one trick pony – and while the stunning 3D visuals are probably what attracts most of the site’s customers, the amount of content actually puts other, more popular apps to shame – especially when it comes to Sit & Go tournaments. 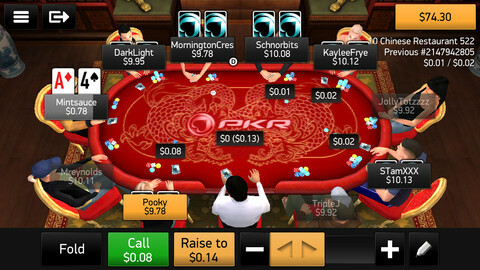 Whether you care about all the graphical bells and whistles or not, if you’re a true poker fan there’s simply no reason not to give PKR a try if your iPhone is up to the task. Read these other mobile poker room reviews.